The number one indication of a healthy fiddle leaf fig is new growth. So when fresh young leaves appear from the top of your plant, you may feel ecstatic. 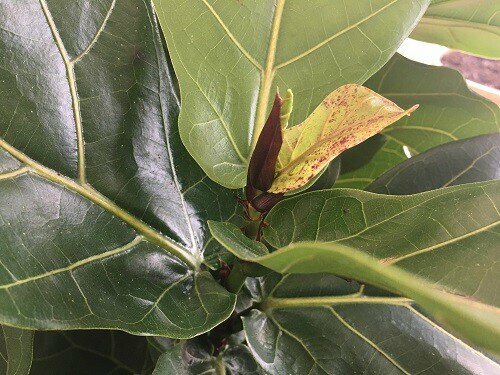 But wait – what are those tiny red spots on the new growth of your fiddle leaf fig? Yes, this is my own plant! See? Even experts can be caught off guard when caring for the celebrated ficus lyrata. 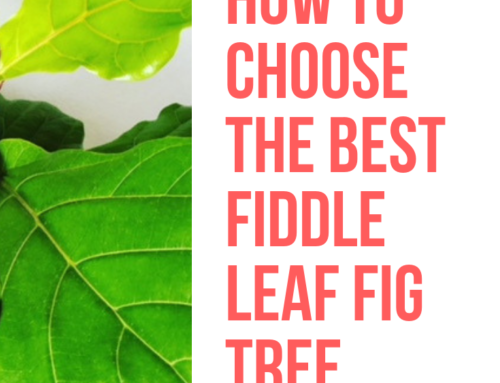 Thankfully, the experience taught me everything I need to know help you with your own fiddle leaf fig. So as usual, we’ve got you covered. 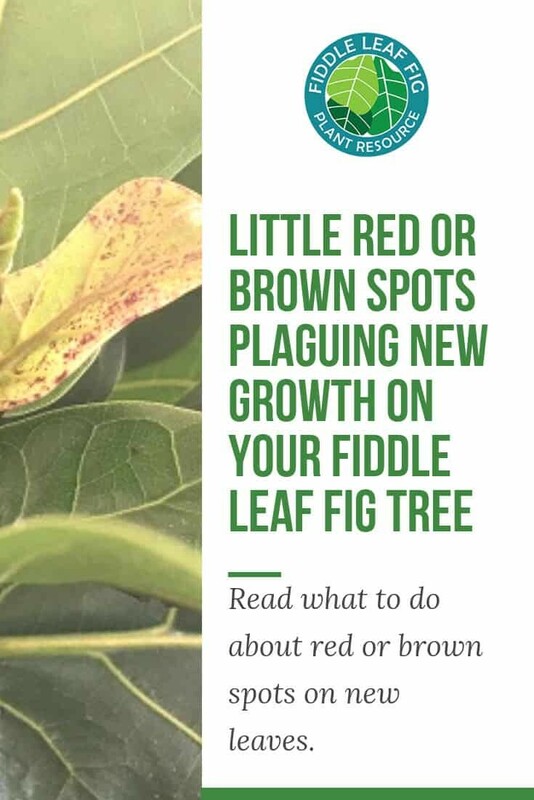 Here’s what causes little red or brown spots on the youngest leaves of a fiddle leaf fig tree, what will happen as those little leaves grow bigger, and what you can do prevent this issue from happening again in the future. 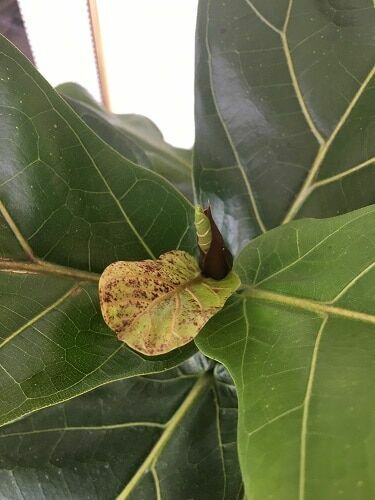 The most common cause of small red spots on new leaves of fiddle leaf fig plants is edema. Edema (also spelled oedema) is often a symptom of moisture stress, which is caused by incongruous watering. The ficus is especially prone to edema, as noted by the Missouri Botanical Garden, an accredited charity famous for horticultural education. When a plant’s roots absorb more water than the leaves can consume or transpire, pressure builds until the leaves’ cells burst. Subsequently dead cells are visible as blisters or dark, 1-3mm bruises. Don’t worry, mild cases of edema are completely normal and even expected, especially during times of growth when you want to ensure your plants have plenty of water to support the new leaves’ development. 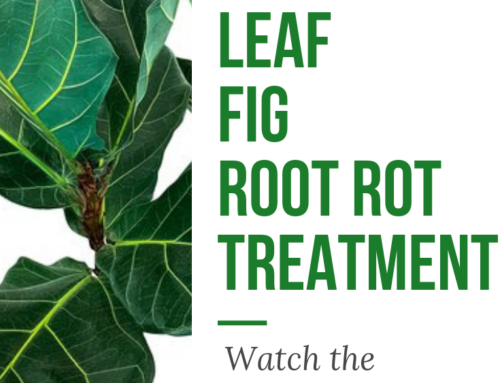 You may have heard before that fiddle leaf fig trees prefer to be dried out between waterings. While this is sometimes true, a more accurate, healthy approach is to take your cues from the plant’s growth cycles and increase watering while the tree is sprouting new growth – all while paying special attention to root health. This way, you can accept mild edema without risking root rot. Depending on the severity of the case, your new spotted leaves may grow out to appear completely normal and healthy. Here’s the above troubled leaf a few weeks later, recovering. In fact, with the right watering regimen (moving forward), the spots will completely disappear. In time, new growth will show up bright green, smooth, and spotless. For diligent caregivers, that’s the most common outcome. A pretty positive prognosis to be sure! Unfortunately, if the watering situation is not addressed, the new growth that shows up after this spotted version will appear worse still. Soon, leaves will appear dead on arrival. The simple, surefire solution is to get a moisture meter and learn how to use it. Spider mites tend to target new growth, since the skin of older, thicker leaves is too difficult for them to penetrate. 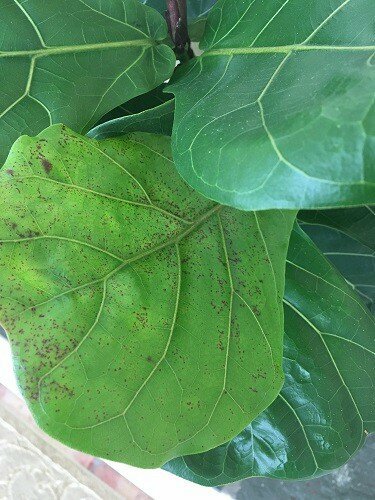 Many ficus lyrata caregivers are surprised to look closely at what they suspect to be edema, only to realize the tiny dots are moving! Upon closer inspection, silky webs are often detected, confirming the verdict: Spider mites. Thankfully, spider mites can be controlled naturally. A strong jet of water easily dislodges both the bugs and their eggs, so usually, no harsh chemicals are not needed. If this tried-and-true method fails, experts at Colorado State University offer many effective alternatives. It’s important to note that the appearance of a web is not the only determining factor when identifying mites. In fact, there’s a spider mite described by scientists at the University of Florida that injures the ficus lyrata without the telltale web. The pest is called the false spider mite for this reason. A good way see if your red dots are false spider mites is to grab a magnifying glass and watch as you disturb some of the dark spots. If they move slowly when perturbed, they are mites. And if there’s no webby silk nearby, they are likely these false spider mites. As soon as you get over the heebie-jeebies, apply the same treatment you would for a case of regular spider mites (above). Affected leaves, once treated, will continue to develop. However, you can expect their growth to be stunted permanently. The good news is if no other factors change, your plant will continue to thrive, producing new growth – without the pests. 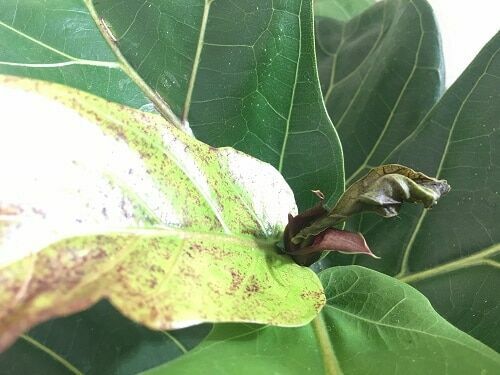 According to the University of Florida Extension office, dark red or brown spots on the leaves of your ficus lyrata may also be a fungal or bacterial problem. 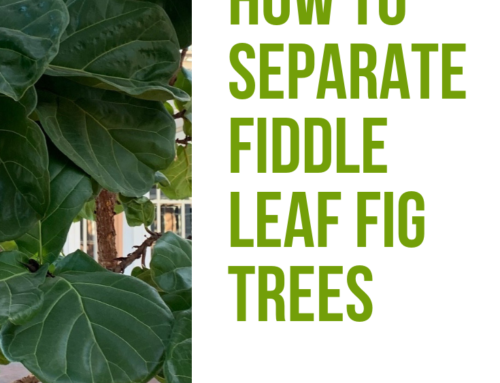 While this issue is rare for fiddle leaf figs, it’s not impossible. This particular plant is much more susceptible to pests and watering problems than bacteria or fungi. Treatment varies depending on the type of bacteria or fungus you’re dealing with. 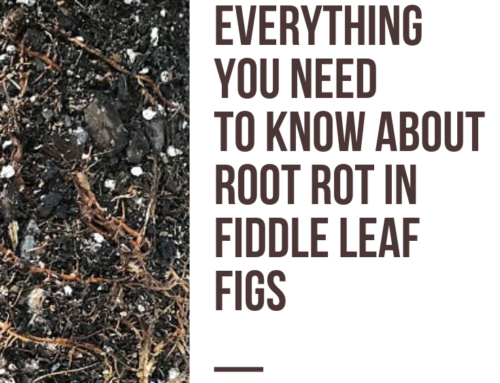 However, common throughout most recommendations is the advice to use well-draining soil, maintain a regular watering regimen, and isolation from potential host plants. 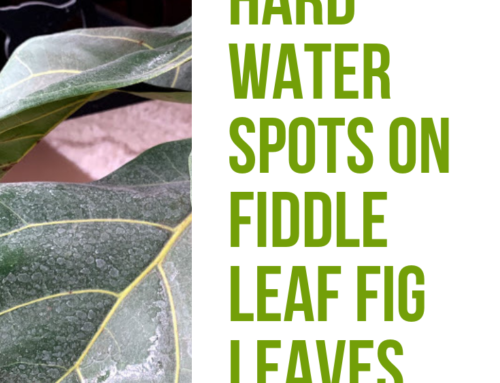 Still not sure why your fiddle leaf fig plant’s new leaves have red spots? Post a picture in our supportive online community. Within hours, fellow ficus lyrata enthusiasts will help you figure out what you’re dealing with. Together, we’ll make sure the next leaf that appears is a healthy one. Meg S. Miller is an influential speaker and multiple award-winning author with nearly a decade of writing experience. In her latest book, Benefit of the Debt (April 28, 2018), Miller offers a unique perspective that gives fresh insight into common sources of brokenness within Christian marriages. Miller, her husband, Joe, and their three children live near Washington, DC, where they own and operate an organic farm. When not writing, Miller loves doting on her six prized fiddle leaf fig trees. Learn more about Meg at www.benefitofthedebt.com.